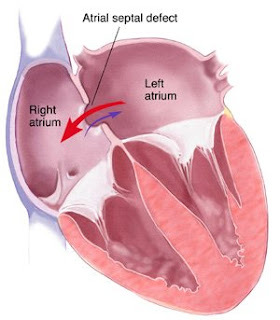 In patients with an atrial septal defect, an opening between the left atrium and the right atrium allows blood to shunt between the chambers. Because atrial pressure normally is slightly higher in the left atrium than in the right, blood typically shunts from left to right. The pressure difference may force large amounts of blood through the defect during diastole. If the hole is more than 1/8 (1 cm) in diameter, the atria act as a single chamber. Most infants with an atrial septal defect have no significant left-to-right shunt and no symptoms because during diastole, blood flows toward the ventricular chamber (usually the right), which has thinner, more compliant walls. Symptoms of left-to-right shunt typically develop in adolescents and young adults because the left ventricle becomes thicker over the years from increased left ventricular end-diastolic pressure. This increased ventricular resistance forces blood through the defect rather than into the ventricles. An atrial septal defect is found in about 10% of children who have congenital heart disease and who have lived past their first birthday. It's almost twice as common in females as in males and has a strong familial tendency. Although an atrial septal defect is benign during infancy and childhood, delayed development of signs and symptoms and complications makes it one of the most common congenital heart defects diagnosed in adolescence and adulthood. Although the prognosis is excellent in asymptomatic people, it's poor in those with cyanosis caused by large, untreated defects. The cause of an atrial septal defect is unknown. In this disorder, left-to-right shunt results in right ventricular volume overload, which affects the right atrium, right ventricle, and pulmonary arteries. Eventually, the right atrium enlarges and the right ventricle dilates to accommodate the increased blood volume. In some adult patients, fixed (irreversible) pulmonary hypertension causes the shunt to reverse direction; unoxygenated blood enters the systemic circulation, causing cyanosis. Right and left ventricular hypertrophies become significant. Atrial arrhythmias, heart failure, and emboli may occur. Children with an atrial septal defect seldom develop heart failure, pulmonary hypertension, infective endocarditis, or other complications. Small defects typically go undetected in a preschooler, although the child may have a history of fatigue, shortness of breath after extreme exertion, and frequent respiratory tract infections. A large defect may retard a child's growth. Cyanosis may develop, especially if right ventricular outflow is obstructed. Inspection of the jugular vein may reveal a strong pulse preceded by a systolic collapse. Inspection of the chest wall may reveal left chest prominence. An impulse may be palpable in that area. In children, auscultation may reveal an early to midsystolic murmur, superficial in quality, heard at the second or third left intercostal space. If the patient has a large shunt the result of increased tricuspid valve flow a low-pitched diastolic murmur at the lower left sternal border can be heard. The murmur becomes more pronounced on inspiration. The intensity of the murmur is a rough indicator of left-to-right shunt size, but its low pitch can make it difficult to hear. The most diagnostic sounds are a fixed, widely split S1 (caused by delayed closure of the pulmonic valve) and a systolic click or late systolic murmur at the apex (resulting from mitral valve prolapse, which occasionally affects older children with atrial septal defects). Adult patients with atrial septal defect complain of more pronounced symptoms, such as fatigue and exertional dyspnea. Symptoms may become severe enough to sharply limit the patient's activities, especially after age 40. If the patient has a large, uncorrected defect and fixed pulmonary hypertension, auscultation reveals an accentuated S2 and, possibly, a pulmonary ejection click and an audible S4. The patient becomes cyanotic and develops clubbed nails; severe pulmonary vascular disease may lead to syncope and hemoptysis. Chest X-rays show an enlarged right atrium and right ventricle, a prominent pulmonary artery, and increased pulmonary vascular markings. The sinus venosus defect is characterized by an absent right superior vena cava shadow and entrance of the horizontal pulmonary vein into the upper right cardiac shadow. Electrocardiography results may be normal but usually show right-axis deviation, a prolonged PR interval, varying degrees of right bundle-branch block, right ventricular hypertrophy, atrial fibrillation (particularly in severe cases after age 30) and, in patients with ostium primum, left-axis deviation. Cardiac catheterization can be used to confirm an atrial septal defect by demonstrating that right atrial blood is more oxygenated than superior vena caval blood, which indicates a left-to-right shunt. Catheterization also can be used to help determine the degree of shunting and pulmonary vascular disease. Pulmonary artery systolic pressures are usually positive. Dye injection shows the defect's size and location, the location of pulmonary venous drainage, and atrioventricular valve competence. Cardiac catheterization is performed only if inconsistencies in the clinical data exist or if significant pulmonary hypertension is suspected. Operative repair is advised for patients with uncomplicated atrial septal defect and evidence of significant left-to-right shunting. Ideally, this is performed when the patient is between ages 2 and 4. Operative repair shouldn't be performed on a patient with a small defect and trivial left-to-right shunt. Because an atrial septal defect seldom produces complications in infants and toddlers, surgery may be delayed until they reach preschool or early school age. A large defect may need immediate surgical closure with sutures or a patch graft. Alternatively, placement of an atrial occluder during cardiac catheterization is becoming a more common intervention than open-heart surgery. The patient will carry out activities of daily living without weakness or fatigue. The patient will maintain hemodynamic stability, and cardiac output will remain adequate. The patient or her parents will verbalize understanding of the atrial septal defect and plans for treatment. The patient will report that she has more energy. The patient will maintain adequate ventilation and oxygenation. The patient will remain free from signs and symptoms of infection. Encourage the child to engage in any activity she can tolerate. Living as normally as possible is important to avoid illness-dependent behavior patterns. Closely monitor vital signs, central venous and intra-arterial pressures, and intake and output. Give an antibiotic and an analgesic, as ordered. Provide range-of-motion exercises and coughing and deep-breathing exercises.